Our Malia Ohana coffee sold out last year and has not been available until now. 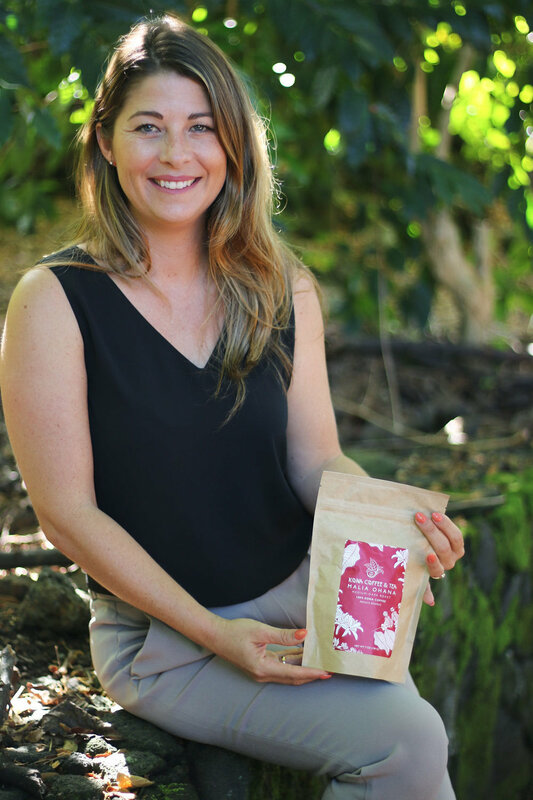 The namesake of this coffee, Malia Bolton Hind, explains what makes this coffee so unique. There aren’t many 100% Kona coffee farms that have complete control from seed to sip. By this we mean growing, milling, roasting and packaging only our own private reserve. Most of our coffee is grown on our farm in the Waiono region of Holualoa, also known as the Kona Coffee Belt, on the big island of Hawaii. There is one exception, our Malia Ohana coffee comes from eight acres south of our main farm, in Keauhou Mauka. The region of Keauhou Mauka has been known for its fertile soil and cool weather for centuries. If you look closely at the following map from 1875 you’ll see “best coffee land” labeling this area. Up 2,100 feet above Keauhou Bay, the cooler temperatures and misty afternoons keep the coffee beans ripening on the trees for longer, producing larger, sweeter beans. This farm has also been pesticide-and-herbicide-free for 11 years (although not certified organic). I live in a cottage here on the Malia Ohana farm. The name “Malia Ohana” comes from my name Malia and the Hawaiian word for family. Waking up on the farm, the sun takes longer to brighten this side of Hualalai volcano. Once the sun reaches our fields, you hear the sounds of birds, pigs, and turkeys waking up too. Towering eucalyptus trees shade the coffee groves and a few acres of citrus trees grow among the coffee. The farming of these eight acres is quite labor intensive. Without the use of any pesticides or herbicides to keep the grass from climbing up the coffee trees, the weed whacker is our best friend. We also use a more refined style of pruning. The Kona-style pruning method always leaves four vertical shoots, of all different ages, coming up from the trunk. This requires yearly pruning and assessment of the shoots, usually done by a member of the Bolton family in the spring. We’ve found that this method produces less quantity, but a better quality coffee cherry. The brewed aroma has light cedar notes, raw walnuts, sweet dried plums, and milk chocolate. The taste is mildly sweet, above average body and low acidity with a pleasant finish. Flavors in the cup are hazelnut chocolate and caramel, with a hint of sweet dried plum. Our cupping found that overall this harvest of Malia Ohana has a balanced flavor and is a prime example of a quality 100% Kona profile. Malia Ohana is only available on our online shop and by visiting our Kailua-Kona café, as supplies last. FAVORITE SPORT: Ironically, it’s snowboarding, because I have to travel out of Hawaii, unless I get over my altitude sickness and go to Mauna Kea. My favorite slopes are Tahoe and Whistler.